Kevin Magnussen looks set to be fit for the Italian grand prix this weekend, despite an horror crash at Spa's fabled Eau Rouge on Sunday. The Dane limped from his destroyed Renault and was taken to hospital for checks, with team boss Frederic Vasseur saying he cut his ankle. "On my way home now with a sore ankle but will be ready for Monza," Magnussen, 23, tweeted. The driver's advisor Jesper Carlsen told the Danish broadcaster TV3: "Kevin was in good spirits when I saw him, joking a little, so he's fine. He was smiling when he went in the ambulance. "He's a little bruised, and it will be a few days before he is fresh again, but the important thing is that he is ok," he added. 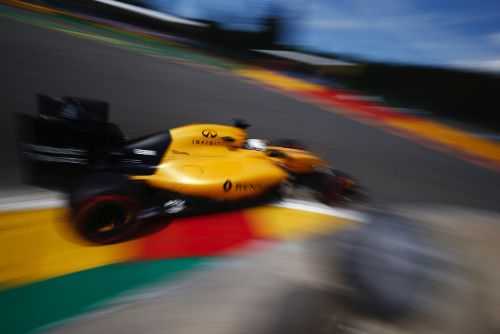 However, team boss Vasseur insisted that it will be the FIA who needs to clear Magnussen before Monza. Renault's reserve Esteban Ocon was recently promoted to Manor. Meanwhile, Germany's Auto Motor und Sport said the FIA will investigate the fact that Magnussen's cockpit collar flew off the yellow Renault during the violent crash. "That was the first time we've seen the protection detach like that," said F1 race director Charlie Whiting.